Efficiently producing over 35 PSIG (2 bar) of boost pressure at high flows, the Xi is the improved version of the famous X (trim) impeller which had redefined what a supercharger should be. Honored and feared on the track this unit is a reliable, top-level performer. 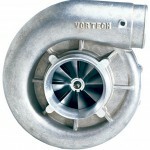 The V-24 Xi is a new supercharger design that improves upon the original Vortech X, a high-performance race supercharger optimized for boost up to 29 PSI at an efficiency of 79%. The Xi is currently being used to power record setting performances in classes such as NMCA Extreme Street (Bob Kurgan 7.846 @ 174.98 with 25 PSI) and NMCA 275 Drag Radial (Andy Manson 7.539 @ 184.85 MPH with 36 PSI). The Xi allows racers to make more horsepower and achieve lower ET’s than are possible with less efficient, competing superchargers. Higher efficiency results in cooler discharge air and reduced parasitic power loss, meaning higher overall power output from the supercharged engine. Racers who are using less efficient superchargers have an opportunity to make more power with the same amount of boost by switching to the Xi.